Get Here UGC NET Sanskrit Traditional Subjects Answer Key 2018. The official answer key is released by NTA. The candidates can access it from the link below, by entering the registration number and date of birth. Candidates appearing for National Eligibility Test on December 18 to 22, 2018, can check the recorded response from the login. The facility to challenge UGC NET Answer Key for Sanskrit Traditional Subjects is also available now. To know more about UGC NET Sanskrit Traditional Subjects Answer Key 2018, keep on reading the details on this page. NTA will release the official Answer Key a few days after the exam gets over. However, the unofficial bodies like institutes and coaching centers have released their answer key which can be used for checking the answer. The official and unofficial answer key will release as per the schedules. 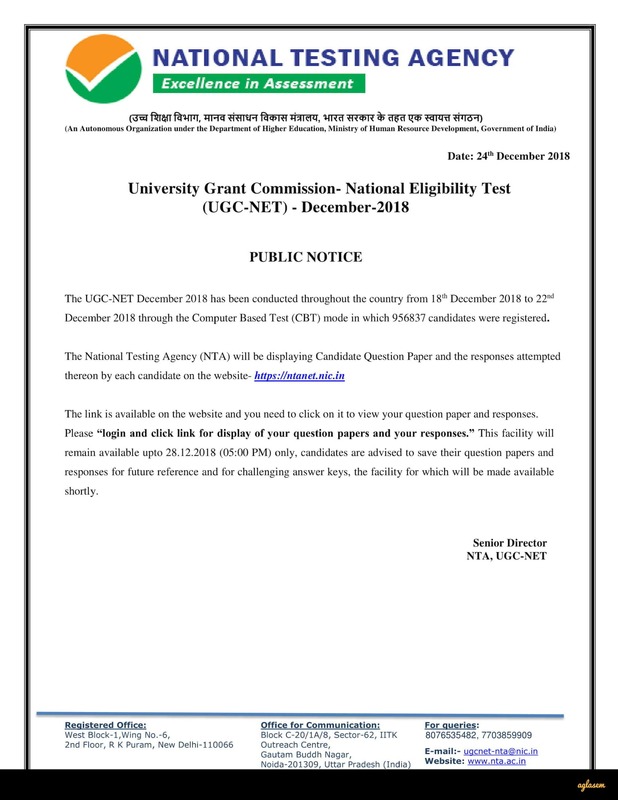 NTA has released UGC NET Sanskrit Traditional Subjects question paper and responses on December 25, 2018. Candidates can check and submit objections until December 28, 2018. View UGC NET Sanskrit Traditional Subjects Question Paper And Response: Click here to login and check NTA NET 2018 question paper and responses. Candidates should note that calculating the scores from the answer key for the wrong set or subject paper will lead to incorrect calculation of the scores. Hence, it is advised that candidate do check it carefully. How to Calculate Score Using UGC NET Sanskrit Traditional Subjects Answer Key 2018? To calculate the score using the answer key of UGC NET Sanskrit Traditional Subjects 2018, the candidates will have to cross check the answers in the key with that marked in the examination and then add/subtract score as per the marking scheme. The marking scheme for Paper 1 is that the candidates will get 2 marks for each correct answer. In all, there will be 50 questions and no negative marking will be done for choosing an incorrect answer option. Similarly, each question in Paper 2 will also be of 2 marks. However, the total number of questions in this section is 100. Negative marking is not applicable. The result of UGC NET 2018 will be announced at nta.nic.in. The Board will announce the result through a login and to access it, the candidates will have to enter application number, roll number, and date of birth. The expected date for the announcement of the result falls in the month of January 2019. The qualified candidates will get the certificate of eligibility. It will be issued by UGC, which will first provide it online but will also send the original copy via post.